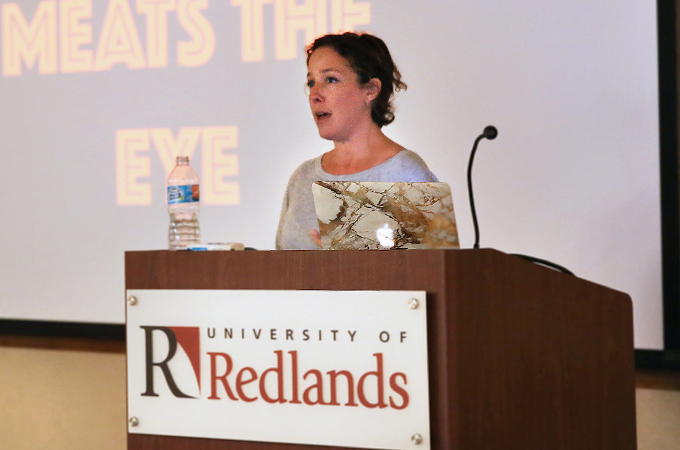 On September 26, members of the University of Redlands community gathered to hear animal rights activist Jenny Brown speak on her path to veganism. Brown is the author of The Lucky Ones: My Passionate Fight For Farm Animals (Avery, 2012) and co-founder of Woodstock Farm Sanctuary in High Falls, New York, where she and her husband, along with their staff members, rescue and care for animals that have escaped industrial animal farming. Taste. We eat animal products for pleasure. Scientific evidence proves humans can live happily without eating animal products. Habit. We eat animal products because that’s how it has always been. Convenience. There is an incorrect assumption that meals are easier to make with animal products. Culture. Meat is central to American culture—eating cheeseburgers and hot dogs is seen as tradition. Ending her talk with a description of online resources and a list of meat and dairy alternatives available at grocery stores, Brown posed a question to the audience: “If we can live a happy and healthy life without bringing harm to others, why wouldn’t we?"